Pears do not usually swim. Despite their rotund physiques, they are not very buoyant. And when they do go for a swim, there are many dangers in the waters! Most of the time, however, the only danger is other pears who like playing tricks. 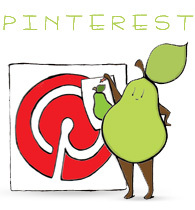 Categories: pear people, Uncategorized | Permalink. Love the floral swimming cap!